tear out the fangs of these lions, O Lord! Let them wither like grass that is trodden underfoot. like a woman’s miscarriage that never sees the sun. the payment you paid us! your children on the rock! Listening to mild mannered monks chant these lines is an interesting experience, but there is of course a theology behind it. The Psalms express and give voice to the entire range of human emotion, good and bad, and to chant the Psalms is to enter into those emotions on behalf of those who might be feeling them. When I heard that a man known for past political activism killed two men on a train in Portland for confronting him over his harassment of two women, I felt angry. When I heard that Islamists had ambushed and killed over 20 Christians as they travelled to a monastery in Egypt, I was furious. When I heard about Manchester, Paris, Orlando, Charleston, the list goes on, I wanted justice. The cowardly acts of terrorists by these white supremacists and Islamist Extremists are cut from the same cloth. In Psalm 137, the Psalmist is reeling from the recent leveling of Jerusalem by Babylonian forces. The carnage left the Jews feeling completely abandoned by God. And at times like this, with more and more senseless violence we can feel the same. As a human being, my initial reaction is a desire for vengeance, justice and annihilation. But as someone who believes in the reality of the Christian story, I am also committed to reading the Psalms through the lens of Christ, who asks me to dash my vice, sin and hatred on the rock of his paschal mystery. The Psalms name the justifiable reaction, but Christ calls us to purify them, and to move toward a place of forgiveness, love and nonviolence. About a week before Lent began, I took a retreat to a Benedictine monastery in central Washington. Unlike several of the other monasteries I have visited, this particular monastery was located in a more suburban setting, and, founded as a small college, the monastery is now a bustling university. 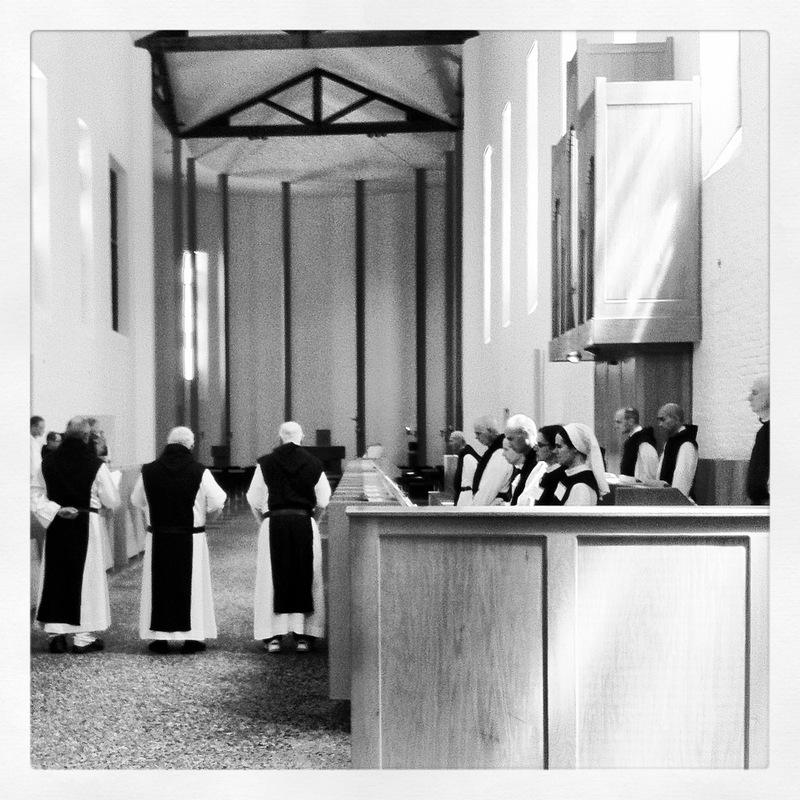 I went hoping for some silence, writing time and immersion in the familiar rhythms of the monastic liturgy. When I arrived, however, the first thing I noticed when I got out of the car, was how loud it was. I could hear I-5 rushing and hushing in the background. In addition, the liturgy was not chanted but spoken, which made it feel less vibrant, and the space of the chapel was one of those ill conceived modernist boxes. Nonetheless, the monks were kind, and I enjoyed talking with them, and learning about the monastery’s history. The monastery started with close to 600 acres, but now retained only about 350, most of which was devoted to the campus and student housing. They had a small farm operation in the 1930s-1950s but it ended by the 1960s. Even with a smaller footprint, the monastery had taken good care of the remaining second or third growth forests, which had a number of walking trails. And even with the white noise of the freeway in the background, I enjoyed walking them. Despite the loveliness of the forest, I ended up having a difficult time writing, felt restless during the spoken Divine Office, and everywhere I went, the freeway was audible. I ended up leaving early, so I could get home and regroup. On the way, feeling the weight of dissertation anxiety and something of the distance that opens between us and the Divine at times, I decided to go for a hike at my favorite protected area in Bellingham, Washington, Stimpson Family Nature Preserve. It was late in the afternoon, and a friend and I headed around the wet, still snowy in places, trail. It is one of the few older growth forests in the area, and I often feel God’s presence there as I breathe the clean cool air, and marvel at the riot of colors. But this time, riding the wave of restlessness from my retreat, I felt a very strong sense of God’s absence. It hit me like a wave, a sudden pang of nihilistic agnosticism, and the darkening forest, still silent and deadened to winter, felt cold, indifferent and lifeless. For several days after this, I pondered the dark mood that had descended. I stopped praying, and considered skipping Church for a few weeks. My usual excitement for Lent turned into a smoldering dread. I recently decided to join an Anglo-Catholic Parish in Vancouver because of its wonderful liturgy, and I had signed up to be part of the altar party as a torch bearer on Ash Wednesday. So, despite the darkness that had descended onto my spiritual life, I decided to go. At first I felt sad, and distant, but as the liturgy proceeded, my attention sharpened, and I began to feel lighter. During the consecration of the Eucharist, which like Traditionalist Catholic Mass is said with the Priest facing the altar, as torch bearer, I knelt with the candle behind the priest. As the bells rang and the priest lifted the bread and then the wine, a subtle shift occurred in my chest. The utter strangeness and beauty of the liturgy penetrated my dark mood, and lifted me back into a place of openness and receptivity. It was nothing profound, or revelatory, but a perceptible change. I was again, ready to enter into simplicity and silence of Lent, in anticipation of Easter. Of course God is present to all things, but She cannot be confined to any one of the elements. Having experienced God’s presence so deeply in forests over the years, it was alarming to feel such a sense of despair, and emptiness. But it is true, just as the forest is a place of beauty and life; it is also a place of suffering and death. If God were wholly present to the forest, there would be no distance to cross between us. “Our relationship with the environment can never be isolated from our relationship with others and with God. Otherwise, it would be nothing more than romantic individualism dressed up in ecological garb, locking us into a stifling immanence” (Laudato Si, 119). I am most certainly guilty of romanticism, but this phrase, “stifling immanence” keeps coming back to me. God is everywhere present, and hold all things in existence at each moment. But there remains an infinite gap between us. As I deepen my Lenten journey with prayer, fasting and silence, I am grateful for this lesson, and it has served as rich food in the Desert of Lent this year. Statue greeting visitors to Gethsemani Abbey. I arrived at Gethsemani in the first mega bus of three. The spire of the Abbey church rose suddenly behind a slight grassy hill. Several monks greeted us and led eager groups of about 20 through the cloister, Thomas Merton’s humble grave, and then up the short road to the hermitage where Merton started living full time in August of 1965. 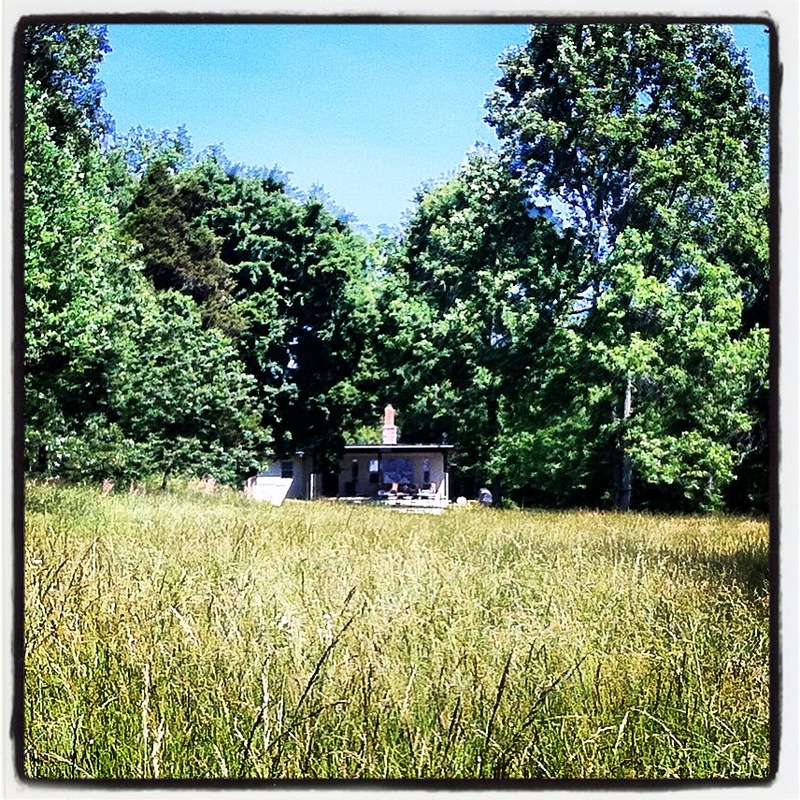 The pilgrim crowd, reverently snapping photos in silence, we converged in waves on the cinder block hermitage. It felt something like a flash mob-monastery—all of us interested to some degree in Merton’s spiritual writings, some of us scholars on Merton’s theology, but none willing to take the lead into the actual life of a monk or nun. We were a momentary cloister, a temporary community. Meanwhile the monastery’s average age climbs, and the monks announced this week that they would discontinue producing the cheese they have produced for many decades. 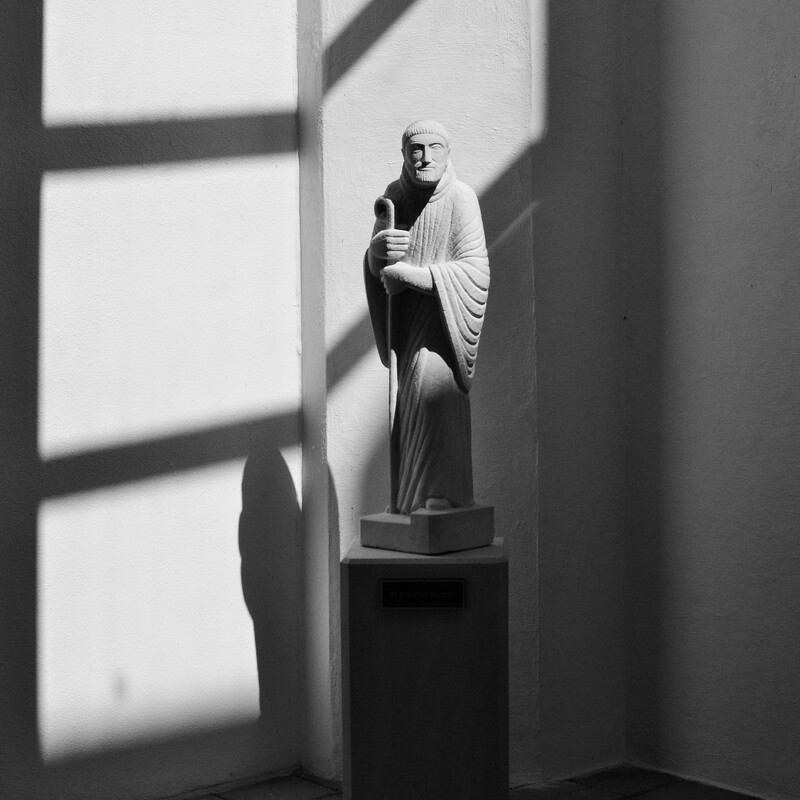 Gethsemani Abbey remains a sacred site to many of us, but it is changing, and its long term future is uncertain. I stood with the others outside the hermitage, drinking coke, listening to a monk tell us stories about Merton’s life here as fire ants, sent forth from their clay monasteries, silently tried to rip my toenails off my sandal-shod feet. We nodded, asked questions, paced through the small rooms, and then wandered outside toward the edges of the clearing to imagine what solitude would be like here. As we made our way back, another group eagerly approached. Monks chanting the noon hour. I didn’t have any profound flashes of insight, or visions of Merton banging out drafts of his immortal prose, but I felt a glimmer of the wholeness of solitude, if only for a few precious minutes. I could hear my breath and the wind rising and falling together. I felt peace. I felt God. Then, a hunched figure appear on the meandering path up to the hermitage. My brief solitude at Merton’s hermitage was ended. As he approached I could see large cuffs in his pants, and a few patches. I could somehow tell he was a monk from Gethsemani, no doubt on his way to stay at the hermitage for a few days, as it is still in regular use. I greeted him, and in with a slightly annoyed but honest tone he said, “You must be a straggler?” I said, “Yes, I will get out of your hair” (he didn’t have very much of it). He introduced himself, and told me he had timed his annual week-long stay with the full moon, so as to be able to attend lauds and mass in the mornings without the use of a flash light. I wished him luck, hopped over a few anthills and was on my way down the road back to the cloister, the road that Merton and many other monks and retreatants have taken over the years. The bell rang, and I made it to the monastery chapel in time to hear the soft chant of the monks of Gethsemani. Later I gave a presentation at the Conference on Merton the hermit and the idea of wilderness. It was a beautiful day. Merton’s hermitage from the path. This year I have been lucky enough to visit a couple of sites with sacred significance to me: Dorothy Day’s Catholic Worker house in Manhattan and Aldo Leopold’s shack in Baraboo, Wisconsin. In past years I have also visited the site of the saw mill where John Muir worked in Yosemite Valley, the Sacred Grove where Mormon founder Joseph Smith had his visions, and Walden Pond. Each of these sites brings into full color the significance of place in our encounters with the Divine, with life. Each of us famous or not, inhabits a place. Our bodies know that place better than our minds. So, to inhabit the places where my mentors worked and wrote is like meeting them in person, or more awkwardly, meeting them in place. I think this desire is universal in humanity, based on the number of sacred sites, shrines, national historic sites, etc. that exist throughout the world. But just because we hold a particular cinder block hermitage in New Haven, Kentucky to be sacred, should not meant that everything outside that space is unsacred. As Wendell Berry has written, there are not sacred places and unsacred places in the world, there are only sacred places and desecrated places. May we continue to visit and protect the places that inspire us, and inspire the places we are at home in.